The story came directly from my own experience. 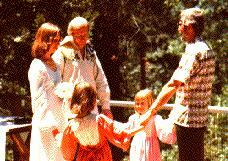 My parents had divorced and what I wanted more than anything in the world was a happy family. I married young hoping to find that. I did have two wonderful little girls, but unfortunately their father was not ready for a family. When we separated he did not often visit or even write to the girls, but Bethany and Sarah and I had some good times anyway. Then I met and fell in love with Gary. Both girls were very happy about it. Bethany was seven and Sarah not quite five when Gary and I decided to get married. Sarah asked, When we marry Gary is his name going to be Carlson like ours? I said that, no, I would be changing my name to Hines and if she and Bethany wanted they could use that name, too. Both of them decided to do that. As in the story they were a part of the ceremony and it was very much as if we were all marrying Gary. The next day was fathers day and they gave him a card, happy to accept him as their father. Gary would have been happy to adopt the girls legally, but it did not seem necessary to any of us. A year or two later Sarah started asking questions about the father she couldnt remember. I answered as honestly as I could, telling her why I decided not to be married to him anymore and what he was like and why he didnt see his children. As I tucked her into bed she said, Our dad wouldnt do anything to hurt us, would he? No, I said. And if we were drowning, she continued, hed try to save us? I said I was sure he would. Its just that were like a puzzle, you and me and Beth. That dad didnt fit with us, but Gary does. It was such a wonderful way to put it. I thought it was a great idea for a story, and I tried several versions. Then finally it occurred to me that the words had come from Sarahs mouth. I needed to tell the whole story in her voice, just simply and straight forward. When Bethany started high school they made her use her legal name. Sarah didnt want that to happen, so when she was thirteen she asked Gary to adopt her, which he was more than happy to do. The illustrations for this book were the most challenging Ive ever done. I think that is because the story means so much to me personally that I wanted the illustrations to be something really special. I wanted the warmth and charm of Garth Williams pictures in the Little House books, and the breath-taking beauty of Nancy Ekholm Burkhardts Snow White. Im not sure I can even really picture that combination, let alone do it! Feeling I had a tendency to tighten up with the colored pencils I had been using, I wanted something looser for this book and decided to try a new medium, acrylics. My art director saw my first attemps and was excited that I was trying something new. Of course I looked at lots of family pictures to do the illustrations, but one I did not have was Gary clicking his heels together. We were happy to learn that he can still do it! The little girl who tells this story lived with just her mother and her older sister until "we married Gary." She knows her sister remembers their father and misses him sometimes, but she doesn't remember. As she sees it "I think it's kind of like we're a puzzle--Mama, Beth, and me. Our daddy didn't fit with us, but Gary does." Although their stepfather gets impatient with the girls sometimes, clearly he loves them, and clearly he's a full member of this family. The story is not particularly eventful, but it will hold young children with its honest depiction of a family. Once again, Hines gets the child's perspective and the emotional tone of the story just right. A charming illustrated endnote shows readers this story is a true one, with a real-life happy ending. In an antidote to the many picture books about the difficulties of second marriages for children, Hines tells a story about a welcomed new stepfather. The narrator and her sister are happy to have Gary in their family because "it's kind of like we're a puzzle - Mama, Beth, and me. Our daddy didn't fit with us, but Gary does." She admits that "sometimes Gary gets impatient with us" but that he brings many good things into their lives as well. Simply and directly told, the warm story is illustrated with watercolor and colored pencil sketches that fill out the emotional content of the story. The endpapers resemble a photo album that chronicles the changes in the family, beginning with Beth as a toddler and ending with Mama and Gary's new baby. A realistic, upbeat story about family life. Sarah doesn't remember her father, but knows her sister, Beth, still misses him at times. And then one day Gary enters the picture, and suddenly the table is set for four again. Hines has done a superb job of tackling a realistic subject - remarriage - without oversimplifying it. She runs through the gamut of emotions that come when someone new enters a household. It is obvious that Gary loves Beth and Sarah and feels comfortable enough to not always be on "good behavior". He sometimes gets cross with them, just as any parent would, and sometimes treats them specially, just as any parent would. The water-color and colored pencil illustrations convey warmth and emotion, blending effectively with the text to help create the joy and happiness that exude from this book. It's message is a happy one - a family has opened its arms to love a new member. The perfect marriage of text and illustrations make this a fine choice for any collection. Hines draws on her own experience for this insightful and finely articulated story, narrated by a girl who represents Hine's own daughter at the age of five. "It used to be just Mama, Beth, and me," she says. But "then we got Gary," and before long "we" marry Gary, a forest ranger who is sometimes impatient and sometimes playful, yet always loving. Building her story around the narrator's observation that she, her mother and sister are like a puzzle and "Our daddy didn't fit with us, but Gary does," Hines creates an age-appropriate and genial portrait of a family. At book's end, snapshot-like illustrations provide and endearing update, marking the arrival of a new puppy and a new baby sister. With its slightly static compositions and underdeveloped figures, Hines art is less accomplished that her text, but clearly just as personal. What a treat! A delightful book about a new stepfather and his relationship with his two young stepdaughters. This book deserves a place in every classroom. How wonderful things can be. The Cincinnati-born author/artist's delightful pictures capture their lives perfectly. A divorced mother lives with her two young daughters. One day a man named Gary comes for dinner, and eventually Mom and Gary marry. The sparse text describes the bonding of the girls with their new father. As seen through the eyes of a child, this positive story explores the issue of her mother's second marriage and presents reactions and feelings she has toward the new, much-welcomed addition to her life and the changed family structure. Anna Grossnickle Hines has another book out. And those of you who know Anna and Gary will find When We Married Gary especially charming. We're told: "It used to be just Mama, Beth, and me." And even though "Sometimes Mama got impatient and scolded," things were going just fine in this fatherless family. Then came a day things grew even better. It was the day "we got Gary." Now there were four chairs at the table instead of three, and HE helped with the dishes. "When we married Gary, Beth and I wore the wedding rings on ribbons around our necks, and we all held hands." Then "Gary said that since we already had a daddy, we could call him Papa if we wanted." Most of the time having Gary is like having another kid in the family. Then again, "Sometimes Gary gets impatient with us, just like Mama." An understanding look from the positive side, in this era of combination families. From Sarah's point of view: "I think it's kind of like we're a puzzle - Mama, Beth, and me. Our daddy didn't fit with us, but Gary does." End papers have been turned into a family album and make a complete story onto themselves. Photos (illustrated) share the growth and changes of the family all the way through to a brand new baby sister. Two uplifting books for the price of one. [T]his story - starting with its perfectly awful title - has a sentimental bedside manner. (Just as men who announce "we're pregnant" are telling lies, children do not get married - a state of affairs for which there are reasons aplenty.) The author says this is a real account of her courtship by, and marriage to, her second husband; as her narrator, however, she has chosen the younger of her two girls by her first marriage. Perhaps the fact that this child remains nameless throughout the text is what underlines the creepy feeling that she's being used as a mouthpiece. A little child, for example, is unlikely to describe an out-of-sorts mother as being "impatient", and it is disconcerting to read a phrase like "Beth said we had a daddy once, but he went away," set amid Ms. Hines's airbrushed pictures of her family's daily life, in which everyone looks exactly alike down to the skin tones. In this bedtime book for children, Anna Grossnickle Hines tells the true story of her second marriage through the narration of her youngest daughter. 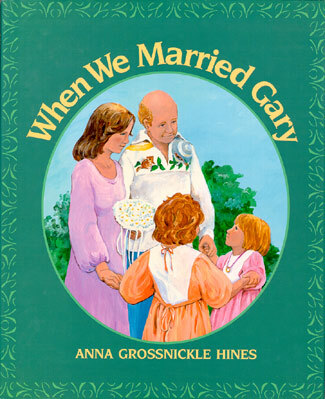 This device emphasizes the family nature of the whole affair, and the importance of the single parent bringing his or her child along through romance, courtship, and marriage (notice the "we" in When We Married Gary). It's all true, so we know the emotion involved and we're glad Hines has let us in on her joyous occasion. She illustrates the book with airbrushed pictures. Sarah's family used to have three members, but then they got Gary. Told from the wonderfully self-centered perspective of a five year old, here is the real-life story of how one family expanded to include a stepfather. The girl's insight in understanding that remarriage affects more than just the people exchanging rings is reflected in how she describes their lives together. The family was like an incomplete puzzle before because their father wasn't the right piece; but Gary is a perfect fit. 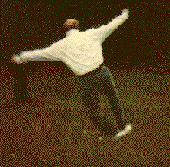 Genesee Valley Parent, May 1997, Pittsford NY. When We Married Gary is a warm and understanding picture book telling the story of a second marriage as seen through the eyes of a child. Reality is sweet enough in When We Married Gary when a family of females replaces a deadbeat dad with a new, more fitting Papa. The two sisters, their Mom and Gary all join hands in the bonds of holy matrimony, completing a "puzzle" in which the pieces finally fit. In this touching picture book, based on the author-illustrator's own second marriage, a young girl tells the story of her stepfather, from courtship to marriage, and of her role in making Gary a part of the family.